All of my wedding garters are available individually or in sets which include a keepsake garter and a toss garter. 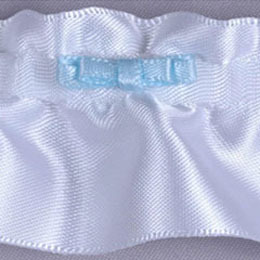 My garters are perfect to use as your "something blue" on your wedding day. Interested in a custom design? Check out my Custom Garter Gallery for inspiration. Sugarplum Garters offers a variety of custom, handmade wedding garters to match every bride’s style, whether it’s flirty, fancy or fun. My unique collection includes traditional wedding garters as well as sports-inspired garters, perfect for surprising your husband on your big day. My production time is currently 2 weeks. Need a garter faster? Check out my Ready to Ship Wedding Garters.